Hand and wrist pain can be caused by a number of different things from arthritis to a pulled muscle or trapped nerve.. More information can be found in the diagnosis section with videos and exercises in the Silver membership section. As the wrist is made up of two rows of carpal bones held together by ligaments it is easy to sprain a ligament. Or strain a muscle around the wrist. Sprains tend to be graded 1-3. With grade 3 sprains the ligament has snapped and may require surgery. Sprains that are grade 1 and 2 some will heal on their own whilst others may need help in the form of ultrasound, massage and mobilisation to help the healing process. Long term exercises to strengthen the wrist would be needed. This is caused by the median nerve getting aggravated as it passes through the wrist into the hand. When the nerve is inflamed it causes tingling and numbness in the hand and fingers especially at night. Conservative treatment such as ultrasound, massage and a splint can help but otherwise an injection or surgery is needed. One of the main areas affected is at the base of the thumb. Fingers can also be affected causing them to become stiff and painful. Massage, acupuncture and ultrasound can all sometimes help. Otherwise a steroid injection can be given or surgery to remove the bone at the base of the thumb. RA typically affects both hands and can be one of the first areas to be affected with RA. There are many drugs which can help so it is important to have a blood test to help come to a diagnosis. 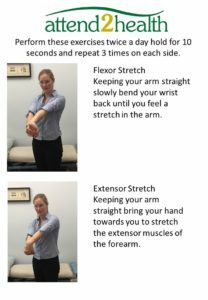 These stretches should be done gently to help obtain more movement in the wrist.